Home News AP News Who has asked him to open the door? Who has asked him to open the door? BJP National President Amit Shah’s Andhra Pradesh visit was quite a flop show for the saffron party which expected huge crowds as it generally does in North India. 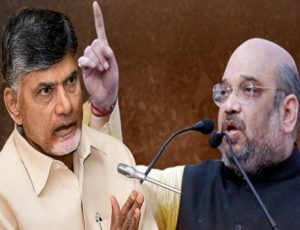 Speaking at one of the rallies today, Amit Shah said that AP Chief Minister N. Chandrababu Naidu has been betraying the people of AP and that the NDA’s doors for the TDP are shut forever. Reacting Amit Shah and Prime Minister Narendra Modi’s unhelpful and arrogant attitude towards Andhra Pradesh, the Chief Minister alleged that both of them have been doing injustice to the state and its people. “They have not fulfilled their promises, as mentioned in the Act and now, they are coming to our own state and talking bad about the development here,” Chandrababu added. Meanwhile, state finance minister Yanamala Ramakrishnudu challenged Amit Shah for an open debate on the funds given to Andhra Pradesh and said that Shah is disappointed with a poor turnout at his rally and hence, has been barking up the wrong tree. “It is clear that people of AP have given BJP their answer by not attending the meetings,” he concluded. Previous articleTV Anchor Aiming YSRCP MLA Ticket? Next articleYatra To Show Congress In Bad Light?